Preheat oven to 375 degrees F. Grease a 9-inch deep dish pie plate OR an 8x8 baking dish with non-stick spray. Add cream cheese, garlic powder, onion powder and sour cream to a large bowl. Using an electric hand mixer, beat until combined and creamy. Add drained jalapeños, cheddar cheese and ¼ cup of the Parmesan cheese to mixture. Mix until combined. Spread mixture evenly into prepared pan. 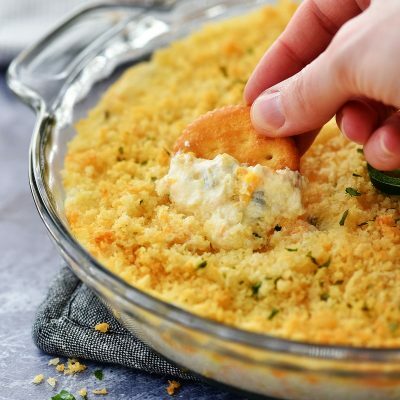 Combine bread crumbs, remaining Parmesan cheese and olive oil to a medium bowl. Mix until combined then sprinkle evenly over the top of dip. Bake 15-20 minutes, or until hot and breadcrumbs are golden brown. Remove from oven and garnish with chopped Parsley, if desired. Serve and enjoy!